Supporters protest the arrests of Esau Peche-Ventura and Yesenia Hernández-Ramos outside the Chittenden Regional Correctional Facility. U.S. Customs and Border Protection said it detained Esau Peche-Ventura, 26, and Yesenia Hernández-Ramos, 19, around 9 p.m. Saturday during a traffic stop near the town line between Franklin and West Berkshire, not far from the Canadian border. 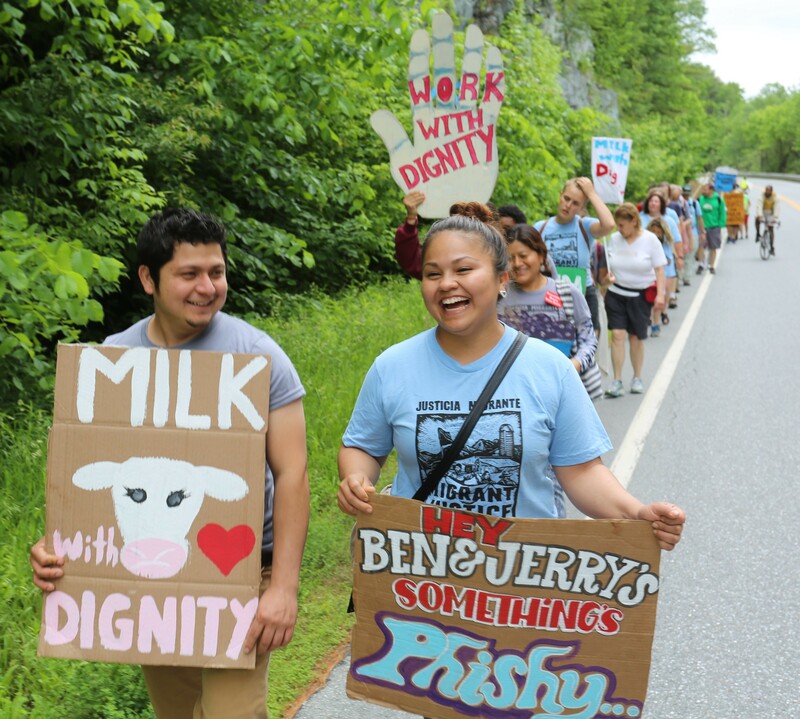 Earlier that day, the couple had walked 13 miles from Montpelier to the Ben & Jerry’s factory in Waterbury as part of the “Milk with Dignity” campaign, calling on the ice cream company to hold its dairy farms to higher standards. Both work on a farm in Franklin County. Now under the custody of U.S. Immigration and Customs Enforcement, Hernández-Ramos was being held at the Chittenden Regional Correctional Facility in South Burlington while Peche-Ventura was detained at the Northwest State Correctional Facility in Swanton. Both are activists with Migrant Justice, a Vermont human rights organization. In the past year, immigration officers have arrested at least four other members of the group. Esau Peche-Ventura, left, and Yesenia Hernández-Ramos march to Ben & Jerry's on June 17. “That’s the level of suspicion we need to perform a vehicle stop,” said Brant, who would not elaborate on what caused suspicion. No traffic violation occurred, according to Brant. ICE officials did not immediately respond to requests for comment. Lambek and 30 other activists met at the South Burlington prison early Monday morning, where they chanted “Not one more” and held signs — some freshly made, others recycled from protests of past arrests — bearing similar messages. We’re here to support a friend, Abel Luna told him. The guard nodded and returned inside. 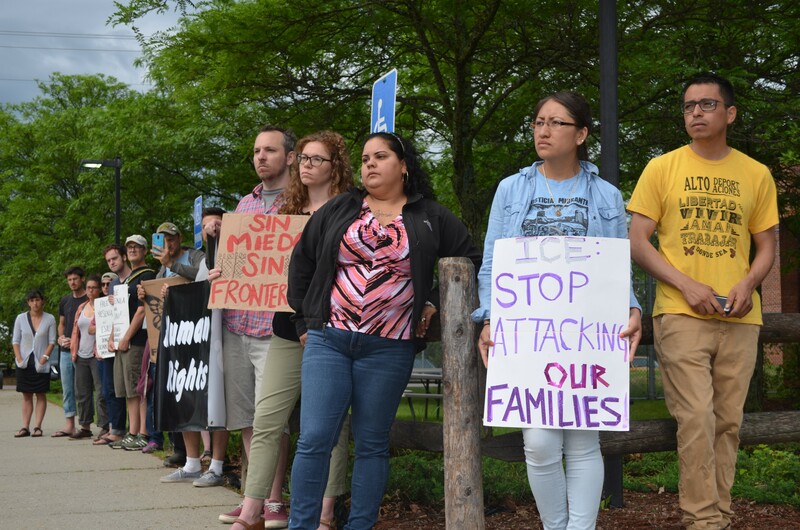 Migrant Justice organized another rally for noon Monday outside the St. Albans ICE office. They anticipated that Peche-Ventura and Hernández-Ramos would be taken to St. Albans for processing before being sent to an ICE facility in Dover, N.H. The group has previously had success advocating for the release of arrested farm workers. Sen. Bernie Sanders’ (I-Vt.) spokesman Daniel McLean said Migrant Justice reached out to their office on Sunday. The senator’s team then “made inquiries to ICE and Border Patrol” about the arrests. According to McLean, Sanders recently met with ICE’s field enforcement regional director and encouraged the agency to focus on detaining criminals rather than community members with no criminal records. “While we do not know the details of this case, there is no question that President Trump’s executive orders on enhancing immigration enforcement have caused widespread anxiety among Vermont’s undocumented farmworkers and dairy farmers alike,” McLean wrote in a statement. Immigration officials arrested two more undocumented Migrant Justice advocates Friday afternoon, according to a Migrant Justice spokesman.